As a response Ebenezer advances towards Swami and tries to wrench his left ear off. Swami’s innocuous questions were driven by the biblical myth of Jesus’s own people having him incarcerated for what they believed was rogue behavior. As per bible, Jesus was a Jew and the Jews petition against Jesus to the Romans for creating nuisance in the society resulting in jesus’s incarceration, punishment. And also it was Swami’s personal belief that God may not like wine and flesh. The story continues further with Ebenezer denunciating ‘Bhagavad Gita’ in another scriptural class and Swami’s father writing a letter to the school principal threatening that he will have his child moved out of the school and the principal taking action, responding to Swami’s father and the novel moves on. Christian missionaries have been working for centuries to subvert native traditions and beliefs. More important observation is that even in the British times in 1930s, it was possible to publish a book that contains factual criticism of Jesus and christian methods. And it probably did not hurt RK Narayan that Mysore was Hindu ruled state. Today in 2010s, it is inconceivable if publishers like Penguin will allow publishing of content that is even mildly critical of christianity and islam. Mass media outlets, influenced and controlled by the church like CNN-IBN will cry wolf. Barkha Dutt would have chewed off R K Narayan as a Hindu fundamentalist. Christians in India have gone much further in their intolernace. They petitioned to the supreme court to ban the movie ‘Da Vinci Code’ and some of the states refused to screen the movie. Government controlled Censor Board put an “Adult Certification” and a disclaimer in the beginning of the movie mentioning that the movie is fictional. There have been efforts by Christians preventing publishing of books that dont show christianity in positive light. We have a long way since 1930s. Incremental changes that can not be perceived have resulted in christian intolerance getting beneath native skin under the cover of sickularism. Demographic changes in particular are among the incremental changes that are most dangerous and lead to cataclysmic political events such as the creation of Pakistan (Islamic demography) & East Timor (Christian Demography). In 1881 Census – native people still made the majority in Punjab, and Muslims minority. By 1941, natives had become minority. Pakistan soon became a reality. In what is Islamic Pakistan, proportion of Hindus continue to dwindle from ~ 25% in 1941 ~1- 2%. In what is India today, proportion of Muslims has almost doubled ~8% in 1941 to ~15% now. 100 years ago, there were hardly any Christians in Nagaland. Because of demographic engineering by christian churches, Today Nagaland is close to 100% Christian; deracinated & dogma indoctrinated Nagas assert Christianity as their heritage; and of course there is a raging decades old Naga insurrection against Indian state. Congress party, which is now controlled by christians has promoted sickularism that has had a large role in institutionalizing medieval christian intolerance and industrial scale conversions for captive vote banks. Foreign governments that seek to influence India have been enabling funding of church’s nefarious conversion activities and intolerance. That coupled with church’s real estate avarice an outcome of western imperialsim, control of academia resulting in academic apartheid & health care, both paradoxically funded by native tax payer, result in a deeply subversive cocktail. Native Indians are less free today than in 1930s. Native Indian people have been losing the cultural war thrust on them under the cover of sickularism, a concept created in the context of church meant to be applied on it. Natives are paying the price for their apathy in letting the concept of sickularism, quixotically applied on their Dharmic tradition, where it has no utility and worse a harmful impact. Among its other banefulness, Sickularism has lowered moral standards, sustains divisiveness in the polity, there by ends up enabling humongous corruption. And Native Indians are less free today than in 1930s. It is time to say a determined ‘No’ to church’s intolerance in India and work to ensure that the church and related institutions are thoroughly secularised. This entry was posted on Friday, December 24th, 2010 at 7:10 pm and is filed under Uncategorized. You can follow any responses to this entry through the RSS 2.0 feed. You can leave a response, or trackback from your own site. ZIM, it is a fact that both Minority religions are proferred substantial privileges under the constitution in the name of secularism, i.e. a mere 18% that too whereas the majority community are merely a farcical laughable stock of 82% residing beyond the constitutional parameters when it comes to rights in earnest. R.K. Narayanan’s compelling reference to Xian traits, rampant until perhaps 10 years ago, must have been a reflection of his direct encounter with this trait. I for one was part of this compulsion during my school days spent in St. Angnes Convent, Mangalore and a few years in St. Michaels High School, Kannur. I can relate to this trait very well especially now when realization of a logic diametrically opposite to what I was exposed to during my formation years became apparent to me. That pseudo-seculars, the pretended seculars, the metropolitan / cosmopolitan culturists (or so they proclaim themselves to be), the political parties who lick the bones these xians/moseys throw in exchange for an assured vote bank and so forth has brought about an ambiance of furious disgust in the right minded majority. These extenuating circumstances are definitely going to boomerang on, not only the CONGRESS but also the Xians and Moseys as well in due time. Swami’s tryst can easily be identified with so many of us. Thankfully, with Internet, enterprising blogrolls like you and the remorseless and fanatic craving for a Hindu Identity burning inside many, an unexpected hindrance has surfaced in the path of these religious-political conversionists. All minority rights should be abolished with immediate effect and let it be merit that judge potential henceforth. I wish I will live to see that day come.!!!!!! In schools owned by Christians, Missionary or Private, stories of Jesus and Bible, and Christian Hymns are thrust on our children. They blank out any mention of all other religions, including the Religion of country – the Hindu Dharma. While, in all other schools, we teach ‘Respect towards all religions’ to our children. Definitely they have been emboldened during the last few years. Solution: Like Swami’s father one has to demand explanation from christian organizations when one notices manifestations of christian hate. Most of the christian institutions get government funds in addition to the fee that natives pay for studying in the christian institutions. They have a right to remedy failing which escalation mechanisms exist. At a systematic level, natives should organize politically and demand that secularism should be forced on christian institutions. Secularism, was a concept designed in west, specifically for dealing with the institutionalised rogue behavior of church. Under the cover of minority protection, hate towards Hindu Dharma should not be justified, and should be challenged. I studied in a convent school and every time I made a mistake I was told very sternly by my principal that I would “burn in hellfire” for my misdemeanors. We also read from the Bible every day and the “fallacies” of other religions, namely of the Hindus was pointed out. Back home, my mother would untiringly point out to me that there was no Hinduism, that there was only the Sanathana Dharma, that which is an everlasting one, that which never perishes. I never converted to any other belief and I still hold my beliefs close to me. Call it by any name you deem fit. If one has no conviction of one’s own beliefs, no point in blaming someone else who is taking the pains to make sure that his/her religion survives/spreads. If Akbar had taken efforts to spread the word of Din-i-ilahi, then maybe we would have a minority/majority in that religion too!! The point being, minority/majority of a belief ( i still refuse to call it a religion) is that which is exploited by the politician to get his due out of the voter. He himself has no idea of the religion he so vociferously supports. Humanity is what needs to survive and people need to be open to stating their minds without putting down the other. I am good not because someone else is bad but because I BELIEVE I AM. Schools need to educate and not dictate so that young individuals can think in an unfettered manner and form their own impressions of all that they experience around them. Many of us have the family support system to manage the christian dogma inculcated hate. Not sure if everyone is so fortunate. You have referred to people’s convictions and efforts by determined groups to spread their religion. Vulnerable sections whose heritage may be harmed in the process should be protected. (a) How church acquired its huge influence on academia. Impact of church’s influence. (c)Existence of guilt trap – To what extent people that get exposed to christian academic institutions, refuse to factually scrutinise the actions of church related organizations.How many understand that it is the native society that has provided space for christian organizations to operate and that the abuse of that trust by the church is ethically, morally wrong. Despite all the pretentiousness on it, vibrancy of our public discourse tends to get sacrificed at the altar of sickular expediency. Accentuating the divide is something politicians do. Fault lines introduced by islam/christianity are particularly problematic not just because of the dogmatic nature of the beliefs but also because of the susceptibility to foreign influences that may be inimical to national interests. Noble sentiments on the way teaching has to happen! Preventing others from taking advantage of the natives’ trust makes sense. But strengthening the core beliefs of the natives by constant re-iteration is what will rid the society of other dogmas that have no interest except the propagation of beliefs in the name of religion. Even the great Pallava King Mahendravarman who adopted Jainism for a while gave it up in preference to his Shaivite tradition with time. Nativity never fades out, it only appears to be so. 1. Christianity will never take root in India he says. (Why, I asked?). He says, – If you notice, most people in India worship Christ in the manner that they worship any God in India – with flowers, coconuts and agarbatti. This Russian thinks that most Christian converts see Jesus as just another idol in the Hindu pantheon. (neither agree or disagree with this idea. But I just liked the way he looked at this). He believes that the Hindu belief goes way too deep into India to be simply ‘converted’. He is sure that the Indian Muslim too is very unlike the Arab Muslim – specially in community structures. Meher is nearly dead – and instead dowry has come into being. The community is largely monogamous. Divorce is way too low compared to other Muslim societies. There are very few unmarried Indian Muslims – unlike the Arab world. Interesting takes on how these ‘religions’ are getting ‘indigenized’. Christianity/Islam initiation lead to insidious changes that play out over a period of generations and some times over centuries. Once the kernel of hate dogma enters the society, potential for reaping hate harvests persist. Ignorance, Apathy and lack of commitment towards defending Dharma aid the hate harvest by dogmatic creeds. That Barrack Obama deems it fit to carry Hanuman-waala key chain or that some Lahoris seem enthused by Basant do not change the fundamental equation of power hierarchy: violence, wealth, knowledge. Nor does it change the reality that Dogmatic creeds’ propagation is essentially under-written by impulses of violence. Russian was taking a stationary still photo. And mixing it up with dynamic realities that play out in the larger canvas of time, space and discourse. Many times in glacial imperceptible speed. Just can’t understand why some people have to be so nuts to force their religious concept on others.. Birth is a sin and can be cleansed only following ‘the only’ path. This drives a lot of ‘bird brain’ Xians to join missionaries where they sincerely think its their job to harvest souls. Soon they realize there’s a mad race amongst themselves to earn more $$ and fame by harvesting more and more souls until the last civilized and free thinking human is consumed. Select intellectuals across the world think that Christianity is a conspiracy wherein, the above mentioned theory when converted to a faith/belief could make a small number of people wield tremendous control over the functioning of the world. To this effect, whatever we read and saw in ‘The Da Vinci Code’ and other original works like ‘Holy Blood, Holy Grail’ etc could only be the tip of the iceberg. Where does RK Narayan fit in here? I strongly believe R.K. Narayan who has widely traveled and met intellectuals from across the globe realized the fishy nature of Xianity and wanted to cleverly communicate this in his writings with wit and valour. RKN was a Hindu but is certainly against caste system practiced in present form. 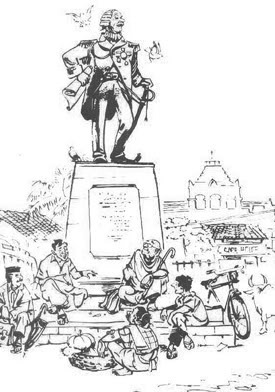 There are several references in his writings that make a mockery of casteist behaviour. I also strongly believe RKN wanted to put the evils of Xianity as well as Hindu caste system in the right perspective for future generations to think and act accordingly. I now would like to thank ZIM for discussing this in detail. I appeal for all Indians to ensure there is more of RKN in school English/school level philosophy subjects for the young guns to learn and think better. RKN was well ahead of his time but fortunately, we know that are we are acting accordingly. ZIM, while we can take comfort to the views of Anuraag Sanghvi and Oliverriddles thru the eyes of a Russian, there is an undercurrent, a pre-conceived plan by both Christians and Muslims to ‘convert’ the Hindus to their manifold on a first come first served basis. They aspire and compete for this first, and factually, both succeed to a large extent over the vulnerable Hindus. Both religions might have a certain ‘indigenized’ norm inculcated into it by the influence of Hindu Religion, but, that is exactly where they score too. Being excellent business schools themselves, they market this similarity to their advantage. Otherwise, how can one explain the all of a sudden existence of a Mosque or Church right in the middle of totally Hindu populated Community! Their network keeps working on the weakest link from a totally Hindu populated community and obtain his ‘LAND’ at a huge price. This might takes years, but vulture is a patient bird, isn’t it. I’ll give you proof. From Coimbatore, drive down the Ooty highway towards Mettupalayam. Soon after Laxmi complex, on the left hand side itself, you will come across a huge board called ‘Cheran Nagar’ within Municipality limits. It is a huge township for retired IT officers and of course, others too. Go right through this township and at the fag end, where there are only Hindus living in peace, one vacant plot of a Hindu was available for sale. Before anyone, including me, could acquire it, CHURCH offered the guy an astronomical price hitherto unheard of in that vicinity, obtained it monopolizing the dire straits of the Owner and (Laugh!!!) has built a huge CHURCH right there. There is not one Christian in that area – YET – there stands a fully functional gigantic church! Sunday masses are held with punctuality with no one else to attend but the Priest and the structure. Nevertheless, Mass is held without fail. I personally went there one Sunday, witnessed the proceedings with not one soul inside or outside the Church other than the Priest, and stood amazed at their sheer determination. If this is not acquisition, then what is? Oh! and by the way, there is not a Temple anywhere there and neither does the Hindu Samaj, Devasom Board, Arya Samaj, Tamil Nadu Temple Authority, See Narayana Trust, Amritanandamaye Amma, Sri Satya Sai Baba, Shri Shri Ravishanker, Iskon (who has it in a big way in Coimbatore) and the likes of them ever think in terms of how the Christians and Muslims do!!!!! To believe that Hindu belief is rooted in Indian Society and can and will take care of itself is nothing more than being sublime to the ridiculous! Good observation. Self-serving consolation is not going to save Dharma. Church planting is an inherent mechanism in Christian evangelism. There is lot to learn from the way the Abrahamic ideologies market themselves. Thanks. As the saying goes, Christianity is the most affluent and best managed business schools in the world. Their dedication and commitment towards expansion of faith any which way possible is perhaps the best and classic ‘lessons learned’ other business schools as well as present day sadaks attempt to faithfully adopt. But Hinduism can not adopt these corporate norms simply because Hinduism is a way of life and not a dogma stipulated in a 1000 page book. Moreover, Hindus are not taught to fear god. We love and pray to god. Whereas both in Christianity and Islam the predominant doctrine inculcated is to ‘fear god’. This basic fact itself segregates our faiths by oceans. To conclude, even if Hinduism wanted to market themselves like their contemporaries, it becomes impossible because the sentiments of Hindus are not confined to either a 1000 page doctrine or a iconoclastic ideology! 1. The threat of religion is real, present and Now! 3. It is a sad day each time we call Indian ideological systems as Hinduism or as a religion. Indian ideological systems is NOT Hinduism and is not a religion. 5. I would remind you of two facts. Half the world follows Indic faith /cultural systems – inspite of everything. The Desert Bloc is still struggling at 40% – after 2000 years of genocide, massacres, annihilations, et al. Tagore stood for an India where native Dharma (clear stream of reason) trumps desert dogmas – islam, christianity (dreary desert sand of dead habits); very reverse of sickularism. Bingo! Sri. Anuraag Sangvi hits the nail in the coffin. This post brings to mind my own experience in a missionary run school where I went to during the first couple or so years of schooling. I recall the nuns would try and get us to wear some sort of pendant/amulet containing images of Jesus, Mary or Christians saints. That above the overly Christian theme in the school where Christian images were present in every room and corridor. We were also made to recite Christian prayers multiple times a day. While there was no outright move to openly convert anyone, the insidious methods used to surreptitiously impose a Christian (evangelical) agenda was undeniable. Thankfully, the teachers (that I remember) themselves were bereft of any such agendas. That said, I can only imagine how much more coerced these agendas would be in non-urban areas, where the teachers themselves might be in cahoots with the Christian management and hence driven a supremacist religious zeal to save the heathen.